UIP Asset Management, Inc., a subsidiary of the UIP Companies, Inc. of Washington, DC, has appointed Michiel van Zadel Vice President of Asset Management and Will Rapaport Director-Acquisitions. Addition, Jonathan Mayer has been promoted to Vice President–Acquisitions. Michiel van Zadel joins UIPAM from Bouwfonds Investment Management in the Netherlands, where he served as Portfolio and Fund Manager, overseeing $1.5 billion of US multifamily investments on behalf of institutional and high net worth investors. His new role as Vice President-Asset Management for UIPAM will include long-range fund and individual asset oversight, including data and risk analysis, reporting, and valuation. Michiel holds a master’s degree from Delft University of Technology in architecture, real estate, and project management and a bachelor’s degree in architecture and urban planning from Hogeschool van Amsterdam in the Netherlands. 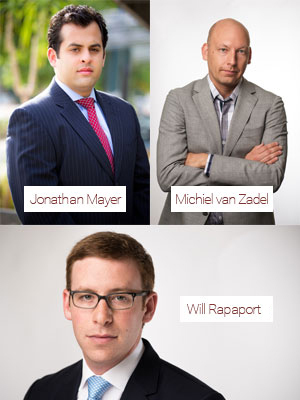 Will Rapaport joins UIPAM from SL Green (NYSE: SLG) in New York City, where he was an Associate in the Investments Group. As UIPAM’s Director of Acquisitions, Will is responsible for the underwriting and presentation of potential acquisitions, performing due diligence, securing and negotiating with capital partners, management of assets from acquisition to disposition. Mr. Rapaport holds a BA from the University of Pennsylvania. Jonathan Mayer has worked for UIPAM for nearly five years, most recently as Director of Acquisitions, with direct involvement in sourcing, underwriting, financing; closing, more than $200 million in acquisitions. In his new role as Vice President–Acquisitions, Mr. Mayer is responsible for providing leadership in sourcing and underwriting new investments, presenting analysis to senior management as well as investing partners, working with debt providers to build the capital stack for each investment. Jonathan holds a BA from Babson College as well as an MBA from University of MD. UIP manages approximately 3,000 apartments in Washington, DC and has renovated and restored more than 20 apartment buildings over the last eight years. UIP’s primary focus is working with tenants in DC and helping them exercise their TOPA (Tenant Opportunity to Purchase Act) rights as well as entitling land and developing new projects. While UIP’s primary focus has traditionally been in the District, the firm invests opportunistically in Washington’s Maryland and Virginia Suburbs. For more information, visit www.uipllc.com.